Welcome, Adult Thing 1 or Thing 2, burlesque dancer, Outer Space Go Go Dancer, raver, forest nymph, futuristic partier, Pokemon's Officer Jenny, Scott Pilgrim's Ramona Flowers, or Katy Perry! Whew! We need to catch a breath after all that. Sorry for the long-winded introduction. We just weren't sure how to greet you, because this awesome Neon Blue Long Wig has more uses and goes with more costumes than we can possibly think of! This gorgeous mop of long, thick, hot blue hair tumbles down into beautifully bouncy curls for a classic "vixen" look with a splash of sci-fi and fantasy thrown in. The possibilities this wig will open up for you on Halloween are virtually endless -- it pairs with many looks, dresses, and costumes. And best of all, it'll save you the trouble of having to dye your hair yourself! 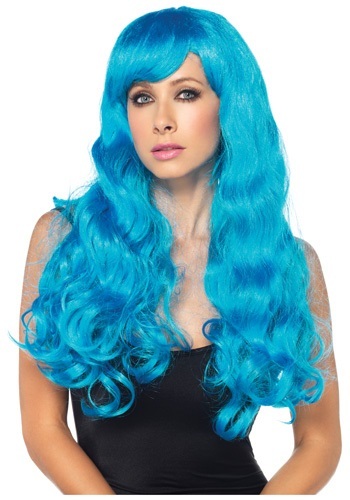 This Halloween, let our Neon Blue Long Wig do all the work!